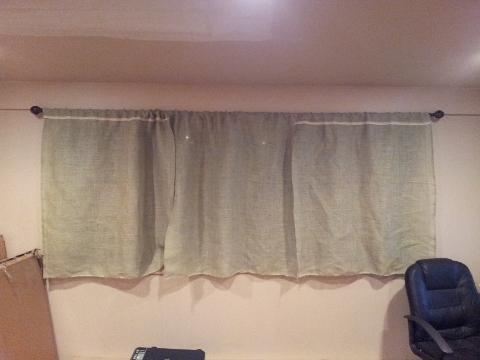 $9 of burlap + $3 of lace + 45 minutes = New Curtains for my office! I have not sewed anything in about three weeks. This was unacceptable. I went out in search of a curtain rod and curtains for the back room/office. I wanted something that would let the light in while giving me privacy. I did not see anything I liked in the length I needed (around 40″), so I wandered into the fabric section of Walmart, which I have such a love-hate relationship with. I love it because I can get everything I need in one fell swoop, but I hate the ethics of the company. I found this awesome sage burlap for $2.97/ yard and decided it would go perfect with the neutral colored room. 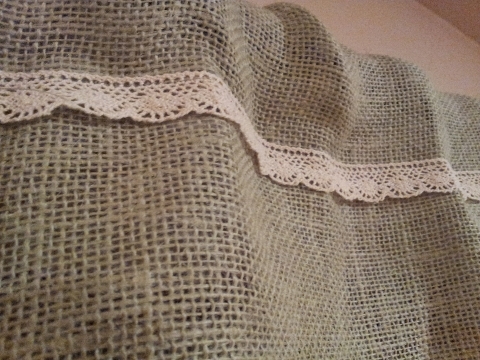 I also found some crocheted lace for $2.97/3 yard roll in cream. I grabbed three yards of the fabric and a roll of the lace and went on my merry way. When I got home, I pulled out my sewing machine and went to work. I needed to sew on my dresser because I do not have my craft room set up yet, and I had to stand while doing it. I also could not find my straight pins, so I did it all by sight. I cut the fabric in three 45″ sections. Since I could not pin the fabric down to make a hem, I picked a string of the burlap and lined it up with the edge of the presser foot and sewed down in a straight line. I did this on both raw sides of the fabric, then folded a finished side down 3″ and stitched it to make a casing for the rod. I left the bottom selvage alone since I liked the unfinished look it gives. I added the lace to two of the three panels (ran out of lace, else I would have done all three) across the casing stitched. And here they are! Looking nice against the neutral wall. The texture of burlap is awesome, especially paired with lace. Everything pairs well with lace. Everything. 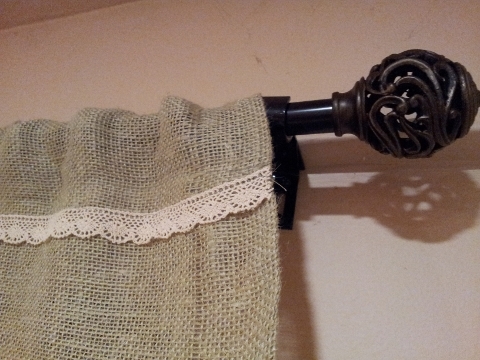 And with a pretty finial on the curtain rod!